#180 18/01/2017 Geschätzte Lesezeit: 6 Minuten. Food Systems – the pathways through which food travels from farmers’ fields to consumers’ forks – are about to change fundamentally in response to multiple environmental and socio-economic pressures. Sustainable food expert Dr Stefan Jungcurt at Research Provider, NIMIRUM, outlines key facts and presents an outlook on future debates around food production and delivery. Food Systems – the pathways through which food travels from farmers’ fields to consumers’ forks – are about to change fundamentally in response to multiple environmental and socio-economic pressures. The UN Food and Agriculture Organization (FAO) estimates that agricultural output must increase by 60 percent to feed the 9 billion people expected to inhabit the planet in 2050. This increase must be achieved on a shrinking amount of land that is heavily impacted by climate change. Land degradation and urbanization are expected to reduce the amount of arable land by .3 percent p.a., resulting in a loss of 10 percent by 2050. The Inter-Governmental Panel on Climate Change (IPPC) predicts that yields on this land could decline by up to 25 percent in certain regions due to climate change. However, agriculture does not only find itself on the receiving end of climate change; it is also the second largest emitter of greenhouse gases. The agricultural sector is responsible for approximately 13 percent of global emissions. Any realistic strategy to achieve the Paris Agreement on Climate Change objective to keep global warming below 2 degrees Celsius must include significant reductions of emissions from agriculture. These pressures challenge all actors along the agri-food value chain to contribute to a transformation towards food systems that are truly sustainable. Sustainable intensification is an emerging paradigm of agricultural production that draws on “nature’s contributions to crop growth, such as soil organic matter, water flow regulation, pollination and bio-control of insect pests and diseases.” Sustainable intensification combines traditional knowledge with modern practices and the considerate use of new technologies, into a toolkit of ecosystem-based practices that can help smallholders and other farmers to achieve higher yields while enhancing natural capital. Research on climate-smart agriculture seeks to further expand this toolset to increase the resilience of agriculture to climate change impacts and reduces emissions, where possible. While sustainable intensification and climate-smart agriculture both embrace some of the principles of organic agriculture, they also clearly recognize the need to increase agricultural productivity and enhance resilience, taking into account the role that new technologies can play in doing so. Resetting the discussion on biotechnologies? Biotechnologies and genomics have uses in agriculture that go far beyond genetic modification, such as genomics-based characterization of animal and plant varieties for improved conservation and breeding, plant and animal disease diagnosis, and the development of vaccines. Genetic modification techniques themselves are rapidly evolving, including new approaches such as gene editing, which allow more precise manipulations of an organism’s genome. Researchers believe that the careful application of gene editing could dramatically accelerate the development of new plant varieties suitable for climate change adaptation. The technique could also open up new areas of activity such as plant “vaccines” that can increase the resistance of plants against emerging pests and pathogens and thus reduce the need for pesticides. The polarised debate on GMOs, however, shows that potential risks associated with these new technologies must be carefully evaluated and communicated; concerns of all stakeholders must be heard and respected. As a recent article published in the New York Times shows, the development of “second generation” genetically modified food is further advanced than most people may think. It is high time to start a conversation on the responsible use of these technologies to ensure that justified concerns do not lead to all-out opposition to new technologies, which may hinder the development of those applications that are really needed. Approximately one third of the food produced worldwide is lost before it reaches consumers.Reducing food waste could go a long way in increasing the amount of food available to feed a growing world population. A common problem in poor countries is that a part of the harvest deteriorates before it can be processed due to poor transport and storage infrastructure. In rich countries, a part of fresh produce is wasted because it does not meet aesthetical standards or other specifications for food processing. Spotted apples, crooked cucumbers and asymmetrical peppers are screened out because consumers are thought to prefer “perfect” produce. Processed products are thrown away when they approach the “best before” date even though in most cases they remain perfectly safe to consume for a much longer time. 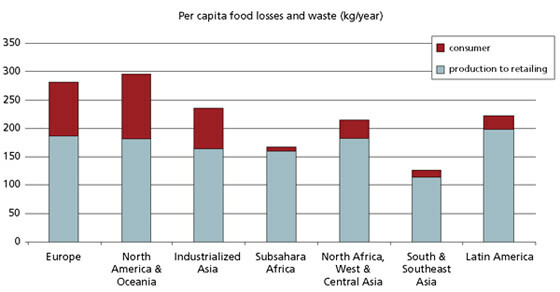 In some countries policy makers and food chains are starting to act against food waste. A Canadian supermarket chain, for example, introduced a new label for “naturally imperfect” produce at a reduced price. In Germany, civil society organizations (“Lebensmittelretter”) collect food from households to deliver it to the poor. The logistics and packaging industries are looking for ways to extend the shelf life of products and reduce transport times and distances. Given the multiple pressures on agriculture and its contribution to climate change, concerted efforts to reduce food waste should be one of the highest priorities. Mit Research von NIMIRUM können auch Sie individuelle Insights und Handlungsempfehlungen für Ihre Projekte nutzen. Urban consumers are increasingly demanding access to locally-produced, fresh food as part of a more environmentally conscious lifestyle. This demand has triggered research and development in hydroponic and aquaponic production systems that do not require soil and have a minimal surface footprint. In hydroponic systems, nutrients are directly delivered to the plants’ roots through a closed irrigation system. Aquaponics are integrated systems of plant and fish production, where fish feces provide nutrients for plants which in turn filter the water in which the fish grow. Internet connectivity and the use of efficient LED lighting have enabled the development of fully automated and scalable systems that can be used in houses and apartments, on rooftops or as green walls on the outside of buildings. More and more architects are experimenting with structures that integrate vertical or hanging gardens that produce greenspace and provide cooling and fresh food. Several companies are developing hydroponic systems that can be housed in shipping containers for on-site production of produce in grocery stores. The same container systems can also be used to grow food in remote areas. While these technologies are still in their beginnings, they could evolve into a new type of high-tech, low-impact food production system located within or near urban centers that would improve access to and quality of food for urban consumers. Over the next several years, we will see an intense social debate about the future of food. Ongoing activities on the part of farmers, scientists, food companies, and consumers around the world will be the focus of a global conversation on the challenge to meet a growing world population’s food demand in times of climate change and soil degradation. Corporate actors in particular need to be prepared to participate and interact with the positions of a broad field of interest groups. This in itself could give them an edge in the transition towards sustainable food systems. NIMIRUM is happy to help you with further research. Boost your expertise about #sustainablefood and related issues. Contact us here. Jungcurt, Stefan: „The Future of Food – rethinking „Fields to forks“”, unter: https://www.nimirum.info/insights/b_180-the-future-of-food-the-quest-for-sustainable-food-systems-in-the-21st-century/ (abgerufen am 13/04/2019). Gesellschaft und Politik weltweit sind im Kampf gegen Hunger erfolgreich, aber Fehlernährungen aller Art sind weiterhin weit verbreitet. Ein koordiniertes Vorgehen ist nötig, um soziale und ökologische Folgen zu entschärfen und unsere Ernährung auf eine nachhaltige Grundlage zu stellen. Schließlich soll Essen auch wieder wirklich Spaß machen. Wie das gehen könnte, beschreibt Stefan Jungcurt. The number of people suffering from hunger around the world is steadily declining. At the same time, there has been a rapid increase in the prevalence of diseases related to other forms of malnutrition. NIMIRUM fellow Stefan Jungcurt shows why a coordinated approach is neccessary to address social and economic implications. Gibt es einen Zusammenhang zwischen Ernährung und Medienkonsum? Was denken die Menschen über Ernährung in den Medien, wie informieren sie sich über Lebensmittel und wem vertrauen sie in Ernährungsfragen? Dr. phil. Diplom-Journalist Tobias D. Höhn vom Institut für Kommunikations- und Medienwissenschaft der Universität Leipzig hat mehr als 700 Online-Fragebögen zu diesen Themen ausgewertet. In den nächsten Jahren werden wir intensiv um die Zukunft des Essens debattieren. Bestrebungen auf Seiten von Erzeugern, Wissenschaftlern, Nahrungsmittelherstellern, Verbrauchern werden zum Thema globaler Gespräche über die eine Herausforderung: Wie lässt sich die Nachfrage nach Lebensmitteln einer wachsenden Weltbevölkerung in Zeiten von Klimawandel und Bodenverschlechterung decken? Fußball und die Grillsaison lassen den Bedarf an Schweinefleisch in die Höhe schnellen. Wie in Deutschland steigen deshalb in Polen die Preise für Schweinefleisch – aber sonst unterscheiden sich die Entwicklungen auf dem Markt für Fleischprodukte. Was sagt uns das über polnische Verbraucher? Scottish and English socities seem to be drifting apart – and Northern Ireland is different again. A closer look at values and attitudes reveals deep rifts. Businesses as well as politicians are wondering: Having distanced themselves from Europe, will Brits also give up on the notion of a United Kingdom? Alle Chinesen sollen laktoseintolerant sein - aber in deutschen Drogerien fehlt Milchpulver, weil es nach China verschickt wird. Wie passen diese gegensätzlichen Vorurteile zusammen? Unser Ländercheck klärt auf, über diese und andere Irrtümer über das Reich der Mitte und die Milch der Kuh. Celebrity endorsements have become popular in marketing and advertising, often enabling retailers to reach out to new target groups. How do you choose the right person to appear on your marketing materials? Here's a helpful guide in 7 steps. Vegetarischer Schinkenspicker? Es gibt immer mehr Menschen, die auf Fleisch verzichten wollen ohne auf Fleisch zu verzichten. Die WHO-Meldung zur krebserregenden Wurst zeigt, dass dies der richtige Schritt ist. Die wichtigsten Zahlen und Fakten zu Vegan, Vegetarisch, Flexitarisch und allem dazwischen von der Expertin Melanie Kirk-Mechtel aus unserem NIMIRUM-Netzwerk. Speise-Eis weltweit: Die Eis-Vorlieben unterscheiden sich, und Eisrezepte sind so verschieden wie Schoko und Vanille. Andere Kulturen, anderes Eis. Wie sieht das aus? Unser Kulturcheck: elf Begriffe und Bräuche im Überblick.